Production of this antibody has been changed on 8th July 2016. The following lots are from ascites and are still in stock as of 8th July 2016: GR260160 and GR268340. Lot numbers higher than GR268340 will be purified from tissue culture supernatant. Please note that the dilutions may need to be adjusted accordingly. If slight turbidity occurs upon prolonged storage, clarify by centrifugation before use. Our Abpromise guarantee covers the use of ab10988 in the following tested applications. Glucagon is a hormone that is secreted by alpha cells in the pancreas. Glucagon antagonizes insulin by converting glycogen to glucose in the liver and increasing blood sugar levels. Glucagon-like peptide 1 (GLP1), Glucagon-like peptide 2 (GLP2), VIP (vasoactive intestinal peptide) and PACAP (pituitary adenylate cyclase activating polypeptide) are in the glucagons hormone family. GLP1 is a transmitter in the central nervous system that regulates feeding and drinking behavior. GLP2 stimulates intestinal epithelial growth. 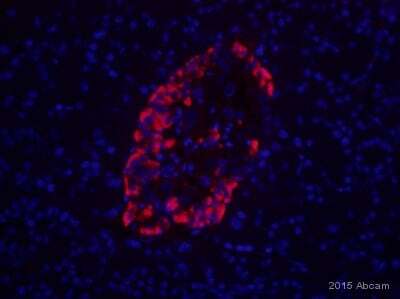 ab10988 at 1/200 staining mouse pancreas tissue sections by IHC-P. The tissue sections were paraformaldehyde fixed and blocked with serum prior to incubation with the antibody for 16 hours at 4°C. A Texas Red conjugated donkey anti-mouse antibody was used as the secondary. 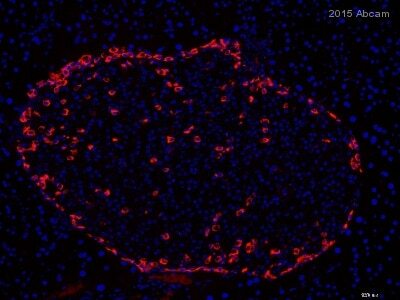 Immunohistochemical analysis of Mouse pancreas tissue labeling Glucagon with ab10988 at 1/1000 dilution. Immunohistochemistry (Formalin/PFA-fixed paraffin-embedded sections) - Anti-Glucagon antibody [K79bB10] (ab10988)Image courtesy of Thomas Schoeppe by Abreview. ab10988 staining Glucagon in rat pancreatic tissue by Immunohistochemistry (Formalin/PFA-fixed paraffin-embedded sections). Tissue was fixed in paraformaldehyde, blocked with 2% serum for 1 hour at 25°C, then incubated with ab10988 at a 1/200 dilution for 1 hour at 25°C. The secondary used was a donkey anti-mouse IgG (H+L) conjugated to Texas Red, used at a 1/250 dilution. Nuclei counterstained with DAPI, green is staining for insulin. 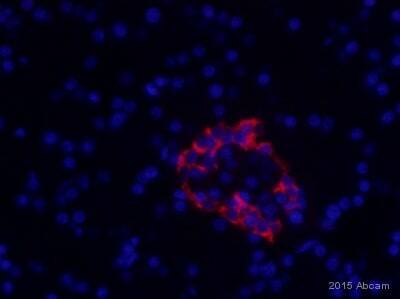 ab10988 staining human islets (beta cells) by ICC/IF. Cells were PFA fixed and blocked in 2% serum for 1 hour at 25°C prior to incubating with ab10988 for 1 hour at 25°C. A Cy3® conjugated goat anti-mouse antibody diluted 1/500 was used as the secondary. Publishing research using ab10988? Please let us know so that we can cite the reference in this datasheet. 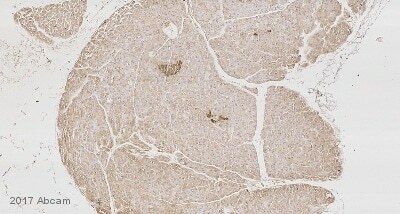 ab87108: ICC/IF image: why is the protein not localized in the nucleus, but rather cytosol or ER? ab10988: blocking conditions, ICC/IF protocol? ab7842: blocking conditions, ICC/IF protocol? For ab10988: ICC/IF was added based on published references and a customer Abreview. Thus, a protocol would be based on these sources. We have not tested it ourselves in this application. I have not yet heard back yet from the lab regading the other antibodies, but will let you know as soon asI do. I hope this information is of some help so far. In the meantime, please do not hesitate to contact us if you need any more advice or information. Anti-Glucagon antibody [K79bB10] (ab10988) Dose this antibody have an immunoreactivity with GLP-1 protein? Thank you for contacting us and your interest in our products. I am sorry for the delay in getting back to you in regards to the Anti-Glucagon antibody [K79bB10] (ab10988). I hope this information has been helpful. If you have any further questions, please do not hesitate to let me know. I have contacted the lab regarding the 4 antibodies you had inquired about, and will be in touch with more informaton as soon as I have it. What is the epitope recognized by the glucagon monoclonal ab10988? Thank you for contacting us. I was able to find a paper describing production and characterization of the ab10988 clone, K79bB10, but as far as I can tell, the epitope has not been mapped. Here is a link to the paper's abstract: http://www.ncbi.nlm.nih.gov/pubmed/3138717 Production and use of monoclonal glucagon and insulin antibodies--reduction of pancreatic insulin in rats by treatment with complete Freund's adjuvant. Acta Histochem Suppl. 1988;35:217-23. I hope this information is helpful to you. Please do not hesitate to contact us if you need any more advice or information.